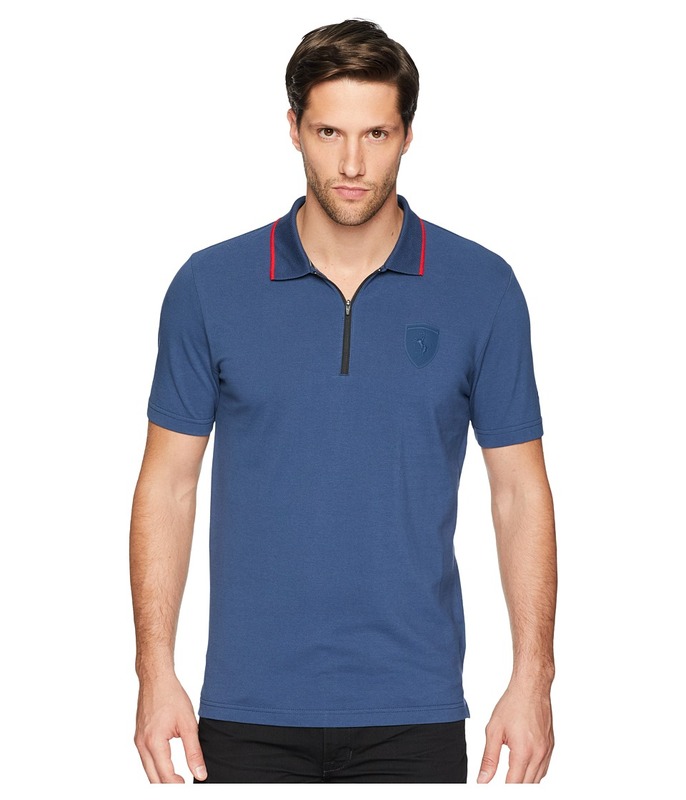 Take your style from 0 to 60 in this PUMA Ferrar Polo. PUMA Lifestyle apparel marries the essence of sports performance with the refined finishes and detailing of the fashion industry. Polo collar with button placket. Short sleeves with banded cuffs. Color blocked detail at yoke. Straight hem. Ferrari logo at left chest with brand mark logos throughout. 100 percent cotton. Machine wash cold, hang dry. Imported. Measurements: Length: 29 in Product measurements were taken using size MD. Please note that measurements may vary by size. Find your roadmap to success on the course. 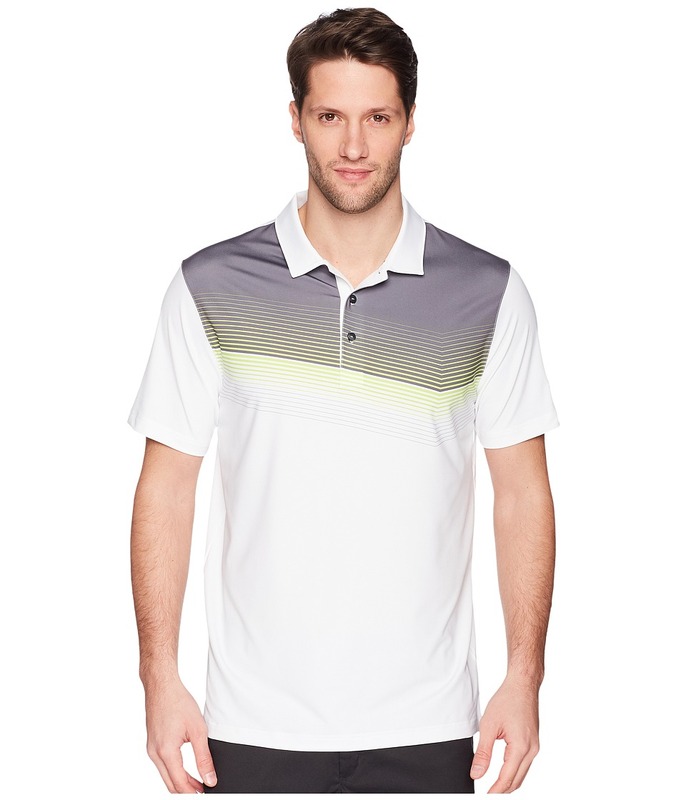 dryCELL fabric wicks sweat away from the skin so that you can play in comfort. Stretch elastane material allows for full mobility. UV protection to shield you from the sun~s damaging rays. Lightweight, jacquard fabric blend. Color blocked and horizontal stripe detail on front body. Fold-over collar. Three-button placket. Short sleeves. 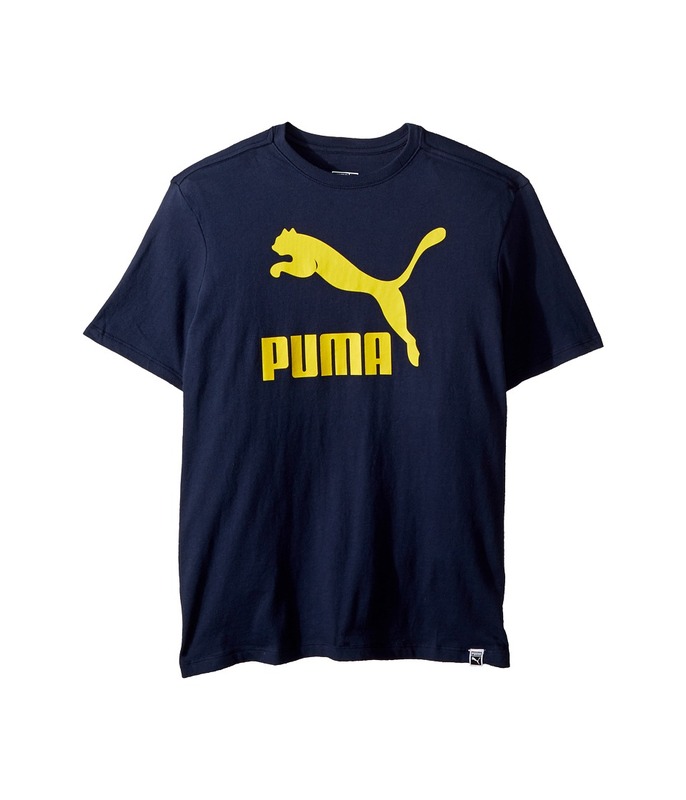 PUMA Cat logo at left chest. 18-Hole logo at center back. Straight hem. 92 percent polyester, 8 percent elastane. Machine wash cold, line dry. Imported. Measurements: Length: 30 in Product measurements were taken using size MD. Please note that measurements may vary by size. 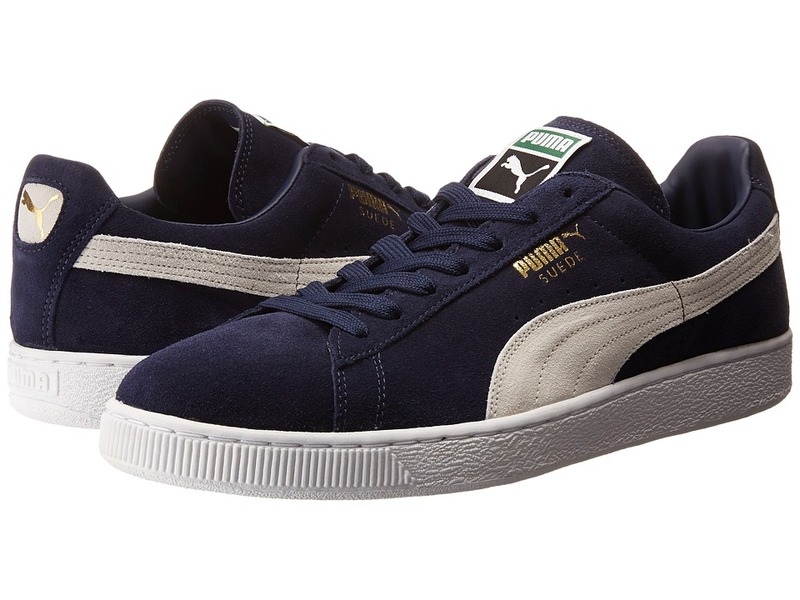 Step up that old school game with the new school flava of the PUMA Suede Classic+. All suede upper. Perforations in the upper offer breathability. Lightly padded collar for comfort. Lace-up closure for a snug and comfortable fit. Smooth leather lining and a padded footbed for great, in-shoe feel. Textured rubber midsole and a ribbed toe bumper for added durability. Rubber outsole for grip. Imported. Measurements: Weight: 15 oz Product measurements were taken using size 11, width D - Medium. Please note that measurements may vary by size. Weight of footwear is based on a single item, not a pair. 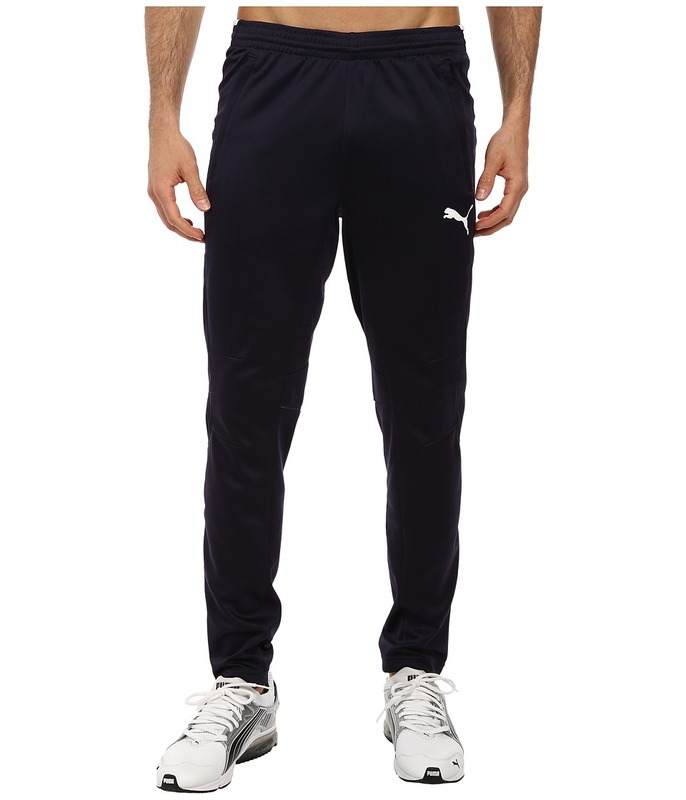 Challenge yourself to a tougher workout in this PUMA Training Pant. PUMA Performance apparel combines technical fabrics and ergonomic construction to meet the rigorous demands of athletes. dryCELL performance fabric wicks away perspiration to promote a comfortably dry personal climate. Elastic waistband with interior drawstring tie for an adjustable fit. Mesh insets behind knees provide increased breathability while you work up a sweat. Zippered leg openings provide easy on and off. Cat logo sits at left hip. 100 percent polyester. Machine wash warm, line dry. Imported. Measurements: Waist Measurement: 30 in Outseam: 40 in Inseam: 30 in Front Rise: 9 in Back Rise: 16 in Leg Opening: 11 in Product measurements were taken using size MD, inseam 30. Please note that measurements may vary by size. 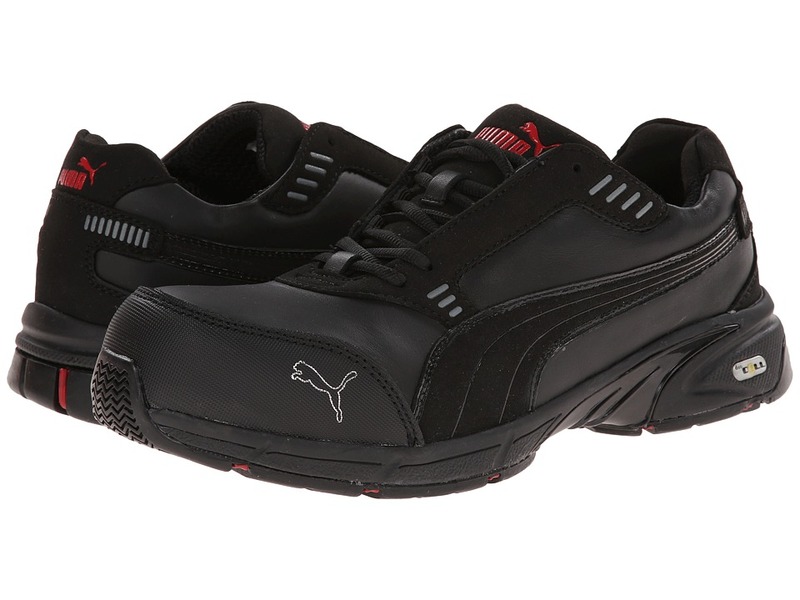 The PUMA Safety Fuse Motion SD has the look and fit of a regular athletic shoe but contains the perfect combination of durable protection and long-lasting comfort to keep you performing at your best every work day. Style number: 642825 (Black/Blue) and 642875 (Black/Red). Designed for a better fit for a woman~s smaller foot. Breathable textile upper featuring FUSE.TEC&amp#174 TPU elements for a lightweight and flexible construction. Traditional lace-up system for a secure fit. BreathActive functional lining provides a drier, more comfortable foot environment. Comfortable evercushion MISS footbed offers lightweight cushioning with a waffle structure that will keep you cool and dry by transmitting moisture away from the foot in wear. The open cells also allow for rapid drying when the shoes are removed. 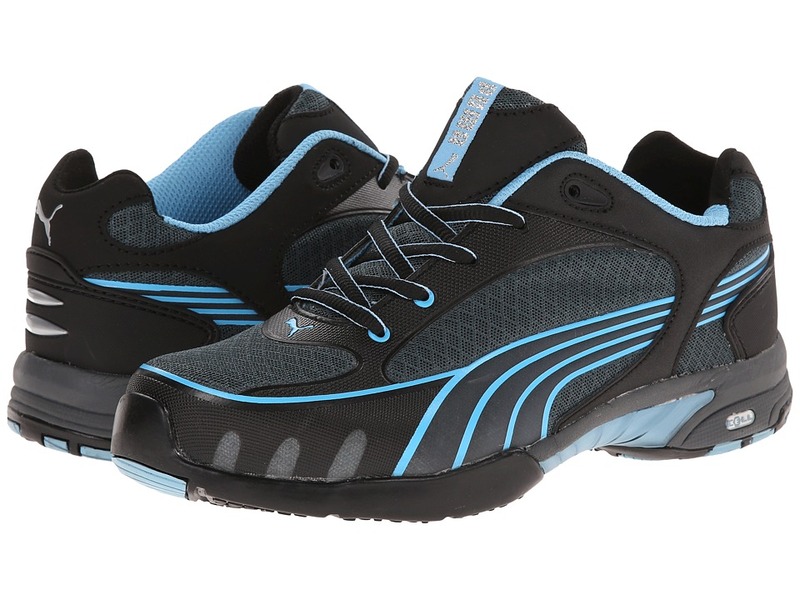 IQ.Cell cushioning integrated in the heel area for added comfort and shock absorption. Slip-resistant rubber MISS SAFETY MOTION with Torsion Control System, heat resistance up to 572&amp#176F, and meets ASTM F 1677 Mark II rating standards, ensuring secure contact to the ground. Steel toe cap meets ASTM F 2413-11 I/75 C/75 safety standards for impact and compression protection. Work shoe is static dissipative which reduces the accumulation of static electricity by conducting the body charge to the properly grounded flooring system. Imported. Measurements: Heel Height: 1 1 4 in Weight: 1 lb 1 oz Product measurements were taken using size 8.5, width W. Please note that measurements may vary by size. Weight of footwear is based on a single item, not a pair. 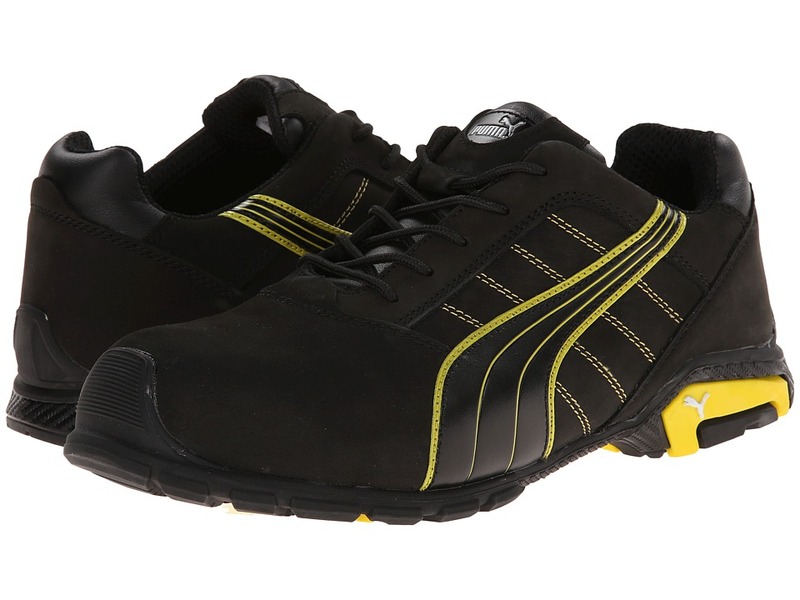 The PUMA Safety Cascades Mid EH is a tough, nonmetallic work shoe that will keep you safe and comfortable every work day. Style number: 630515. Water-repellent oiled cow crazy horse leather upper with a CORDURA leather collar. Mid cut design to protect ankle area. Designed with a wider foot construction for a roomier, more comfortable fit. Over-the-toe extra high scuff cap for wearers who kneel a lot in their job. Traditional lace-up system for a secure fit. BreathActive functional lining provides a drier, more comfortable foot environment. Comfortable evercomfort footbed is ergonomically designed to provide ideal cushioning and support for all-day wear. IQ.Cell cushioning integrated in the heel area for added comfort and shock absorption. Slip-resistant rubber outsole scuff caps with EverFlex decoupling point that allows the heel to find the best contact position according to the user~s weight, size and length of stride. Composite toe cap meets ASTM F 2413-11 I/C 75 safety standards for impact and compression protection. Electrical hazard protection guards against open electrical circuits up to 600 volts under dry conditions. Sole is also heat resistant up to 572&amp#176F and meets ASTM F 1677 Mark II rating standards, ensuring secure contact to the ground. Imported. Measurements: Weight: 1 lb 14 oz Shaft: 6 in Product measurements were taken using size 12, width W. Please note that measurements may vary by size. Weight of footwear is based on a single item, not a pair. The PUMA Safety Fuse Motion SD provides excellent protection from work area hazards and reliable performance so you can work at your best all day long. Style number: 642585 (Black) and 642525 (Black/Lime). Breathable textile upper featuring FUSE.TEC TPU elements for a lightweight and flexible construction. BreathActive functional lining provides a drier, more comfortable foot environment. Traditional lace-up system for a secure fit. Comfortable evercushion BA footbed offers excellent underfoot comfort and support. Slip-resistant rubber MOTION with duoCELL and Torsion Control System, heat resistance up to 572&amp#176F, and meets ASTM F 1677 Mark II rating standards, ensuring secure contact to the ground. Composite toe cap meets F2413-11 I/75 C/75 safety standards for impact and compression protection. Work shoe is static dissipative which reduces the accumulation of static electricity by conducting the body charge to the properly grounded flooring system. Imported. Measurements: Heel Height: 1 3 4 in Weight: 1 lb 7 oz Product measurements were taken using size 12, width W. Please note that measurements may vary by size. Weight of footwear is based on a single item, not a pair. 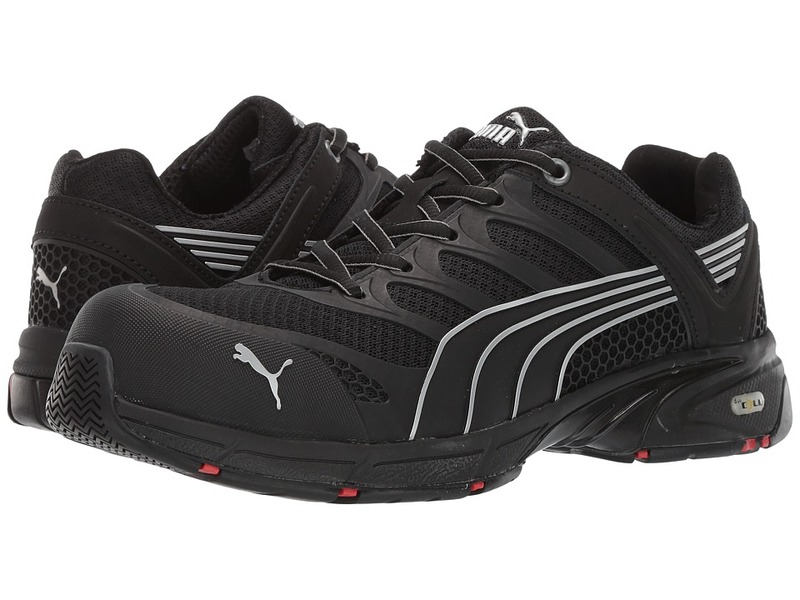 The PUMA Safety Velocity SD work shoe is designed to look like an athletic running shoe, but built with all the protection and supportive comfort you need to keep yourself safe and comfortable every work day. Style number: 642575. Smooth full grain leather upper is water repellent to help keep out the wet elements. Traditional lace-up system for a secure fit. 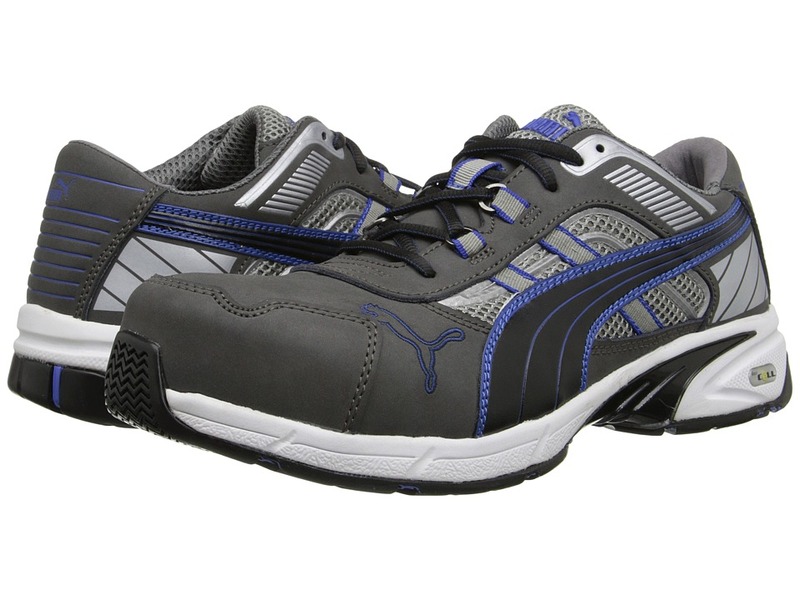 BreathActive functional lining provides a drier, more comfortable foot environment. Comfortable evercushion Gel motion footbed provides incredible comfort, support, and shock absorption for all-day wear. Slip-resistant rubber MOTION outsole with duoCell and Torsion Control System, heat resistance up to 572&amp#176F, and meets ASTM F 1677 Mark II standards, ensuring secure contact to the ground. Composite toe cap meets ASTM F2413-11 I/75 C/75 safety standards for impact and compression protection. Work shoe is static dissipative which reduces the accumulation of static electricity by conducting the body charge to the properly grounded flooring system. Imported. Measurements: Heel Height: 1 3 4 in Weight: 1 lb 7 oz Product measurements were taken using size 11, width W. Please note that measurements may vary by size. Weight of footwear is based on a single item, not a pair. 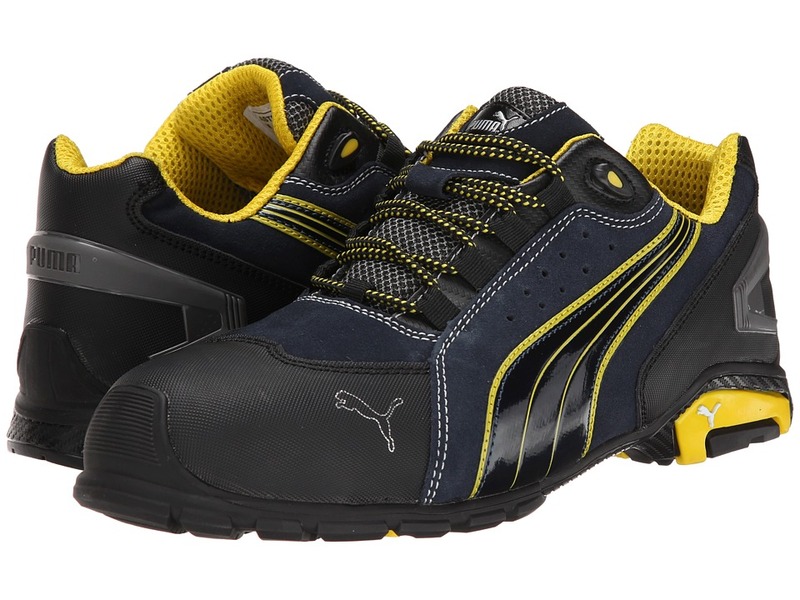 The PUMA Safety Silverstone SD work shoe offers a durable yet comfortable fit with a motorsport-inspired look. Style number: 642635. Suede leather upper. Traditional lace-up system for a secure fit. BreathActive functional lining provides a drier, more comfortable foot environment. High performance evercushion Plus footbed uses a combination of low density cellular BASF Polyurethane and PORON to protect the heel and ball of the foot providing superior cushioning and shock absorption. Slip-resistant motorsport rubber outsole with iCell technology that enhances cushioning and offers excellent stability. Steel toe cap meets ASTM F2413-11 I/75 C/75 safety standards for impact and compression protection. Work shoe is static dissipative which reduces the accumulation of static electricity by conducting the body charge to the properly grounded flooring system. Sole is also heat resistant up to 572&amp#176F, and meets ASTM F 1677 Mark II rating standards, ensuring secure contact to the ground. Imported. Measurements: Weight: 1 lb 8 oz Product measurements were taken using size 11, width W. Please note that measurements may vary by size. Weight of footwear is based on a single item, not a pair. 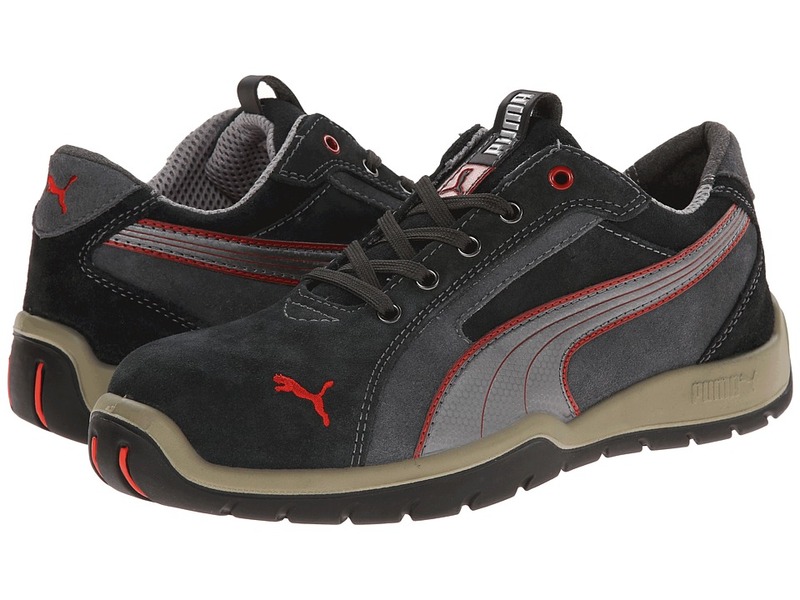 The PUMA Safety Dakar Low SD work shoe has a motorsport-inspired look but with all the safety protection and comfort technology needed to perform at your best every day. Style number: 642685. Suede leather upper. Traditional lace-up system for a secure fit. BreathActive functional lining provides a drier, more comfortable foot environment. High performance evercushion Plus footbed uses a combination of low density cellular BASF Polyurethane and PORON to protect the heel and ball of the foot providing superior cushioning and shock absorption. Slip-resistant motorsport rubber outsole with iCell technology that enhances cushioning and offers excellent stability. Steel toe cap meets ASTM F 2413-11 I/C 75 safety standards for impact and compression protection. Work shoe is static dissipative which reduces the accumulation of static electricity by conducting the body charge to the properly grounded flooring system. Sole is also heat resistant up to 572&amp#176F, and meets ASTM F 1677 Mark II rating standards, ensuring secure contact to the ground. Imported. Measurements: Heel Height: 1 1 2 in Weight: 1 lb 9 oz Product measurements were taken using size 11, width W. Please note that measurements may vary by size. Weight of footwear is based on a single item, not a pair. 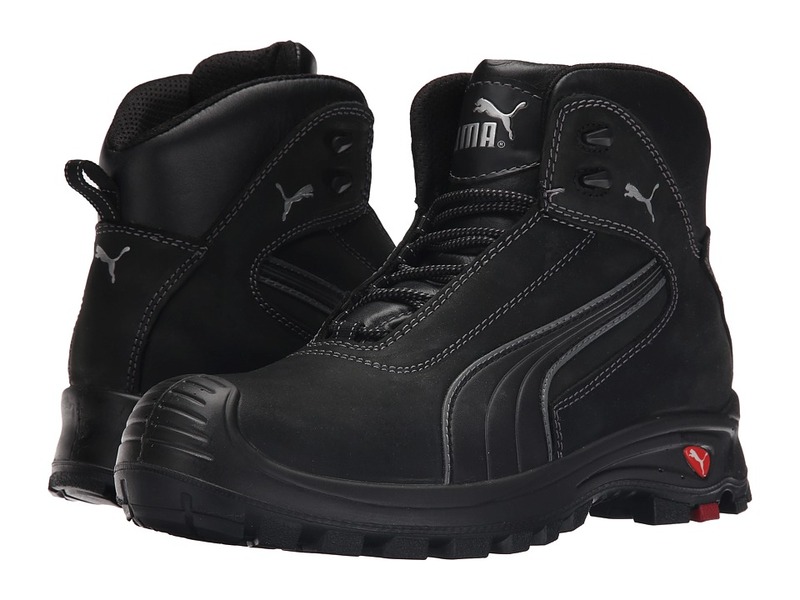 The PUMA Safety Metro Amsterdam SD is a versatile work shoe that has the ideal protection to keep you safe at work and a modern style that lets you wear them well after your day on the job is done. Style number: 642715. Nubuck leather upper. Traditional lace-up system for a secure fit. 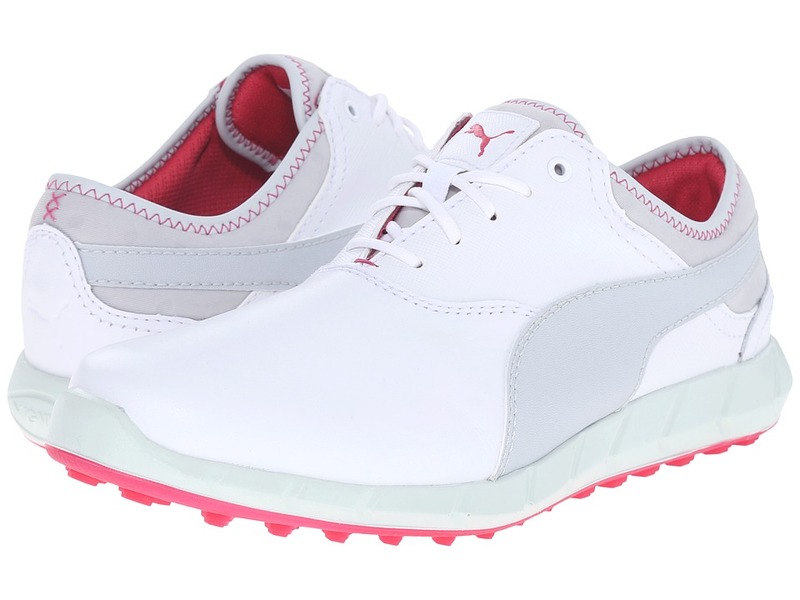 BreathActive functional lining provides a drier, more comfortable foot environment. Comfortable evercushion pro footbed offers excellent underfoot comfort. EVA cushioning pad is integrated in the heel area to enhance maximum shock absorption in every step. Slip-resistant TPU outsole METRO PROTECT is lightweight and low profile, which allows for easy flexibility and provides excellent traction. Aluminum toe cap protection meets F2413-11 I/75 C/75 safety standards for impact and compression protection. Work shoe is static dissipative which reduces the accumulation of static electricity by conducting the body charge to the properly grounded flooring system. Imported. Measurements: Weight: 1 lb 8 oz Product measurements were taken using size 11, width W. Please note that measurements may vary by size. Weight of footwear is based on a single item, not a pair. The versatile style and reliable protection of the PUMA Safety Metro Rio SD shoe lets you easily transition from the work environment to the weekend. Suede leather upper. Style number: 642735. Traditional lace-up system for a secure fit. BreathActive functional lining provides a drier, more comfortable foot environment. Comfortable evercushion pro footbed offers excellent underfoot comfort. 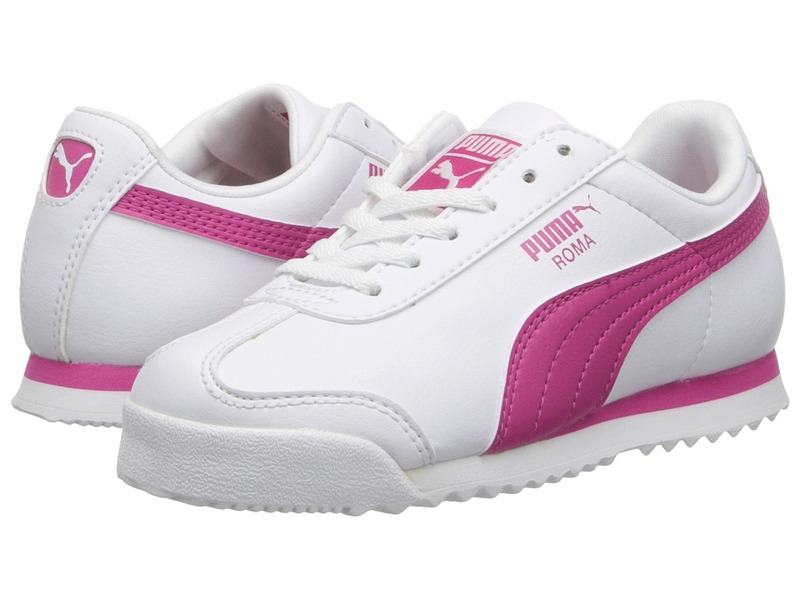 EVA cushioning pad is integrated in the heel area to enhance maximum shock absorption in every step. Slip-resistant TPU outsole METRO PROTECT is lightweight and low profile, which allows for easy flexibility and provides excellent traction. Aluminum toe cap protection meets ASTM F2413-11 I/75 C/75 safety standards for impact and compression protection. Work shoe is static dissipative which reduces the accumulation of static electricity by conducting the body charge to the properly grounded flooring system. Imported. Measurements: Heel Height: 1 1 2 in Weight: 1 lb 9 oz Product measurements were taken using size 12, width W. Please note that measurements may vary by size. Weight of footwear is based on a single item, not a pair. The key to success is traveling around town while looking your absolute best, always! 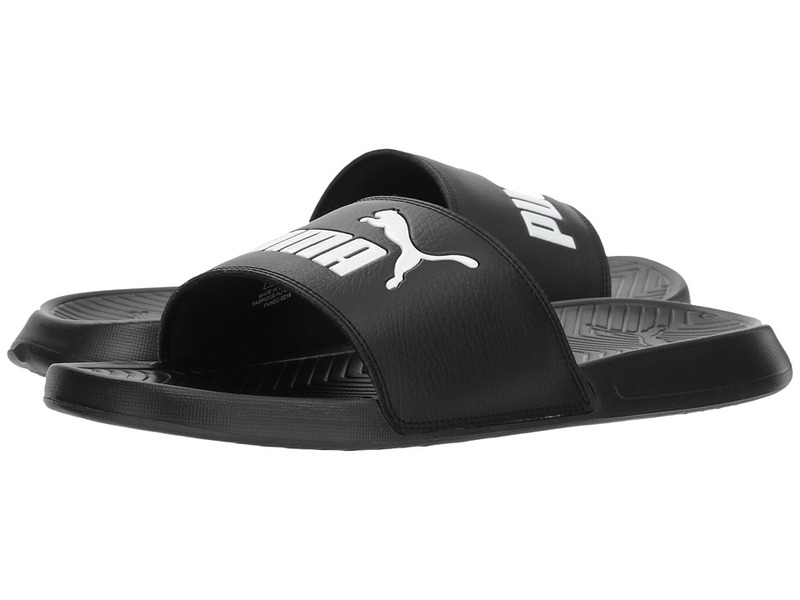 Synthetic upper features a Puma wordmark and cat logo on the strap. Easy slip-on style. Cushioned footbed. Injected EVA outsole. Measurements: Weight: 7 oz Product measurements were taken using size 13, width D - Medium. Please note that measurements may vary by size. Weight of footwear is based on a single item, not a pair. For play on and off the course, the Puma Gold Ignite Golf shoe will complement your active lifestyle with its sleek design and sporty look. Full-grain leather upper for long lasting quality. Lace-up closure. Textile lining. Flexible mesh collar has supportive binding for a superior fit and feel against foot. IGNITE foam in midsole cushions every step with maximum return on energy. 39 strategically placed hexagons provide traction in all directions. Rubber outsole. Imported. Measurements: Weight: 14 oz Product measurements were taken using size 8, width B - Medium. Please note that measurements may vary by size. Weight of footwear is based on a single item, not a pair. 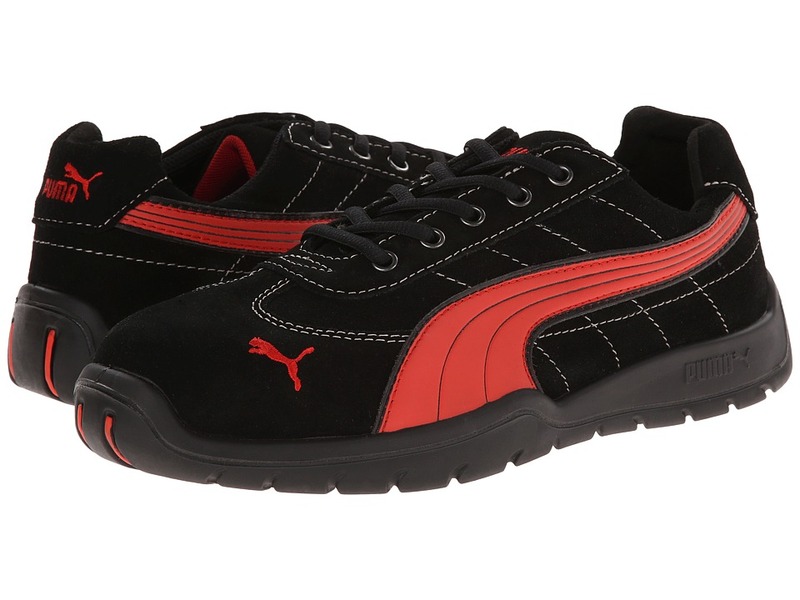 Keep your work day on an even keel with the durable performance and reliable traction of the PUMA Safety Balance shoe! Style number: 642865. Nubuck and suede leather upper. 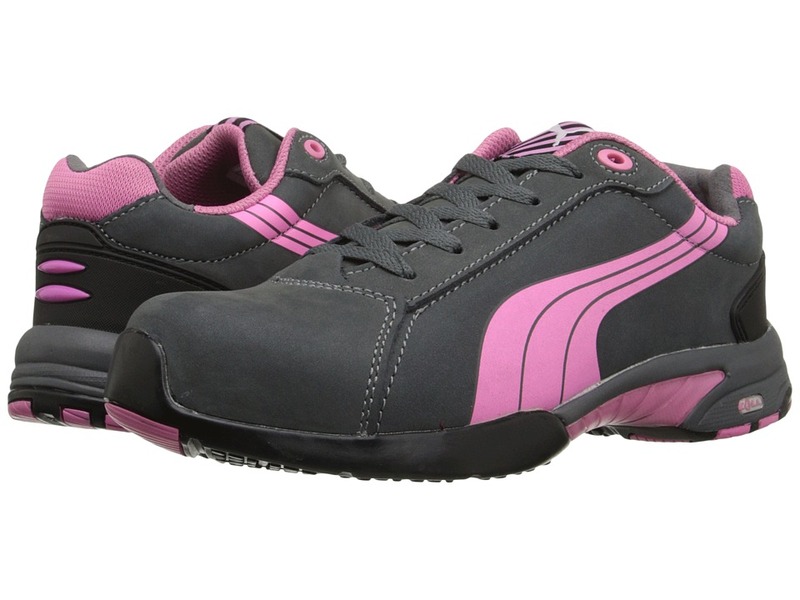 Features a comfortable steel toe cap designed specifically for a woman~s foot. Built on an ergonomic last shaped specially designed for women. Traditional lace-up system for a secure fit. BreathActive functional lining offers a breathable, more comfortable foot environment. Anatomically formed, removable evercushion BA footbed provides excellent underfoot comfort and support. The iCell element in the heel area improves the cushioning and enhances the shoe~s stability, guidance, and comfort. Additional scuff protection in the toe area. TECHNICS PU outsole with different profile elements which offers better ground contact and optimal mobility. Meets or exceeds the highest ASTM F2413-11 standards for toe impact I/75 and compression C/75 protection. SD tested below 35 m0hms and specially designed to be worn, if electrostatic charges need to be reduced by controlled dissipation of charge. Imported. Measurements: Weight: 1 lb 7 oz Product measurements were taken using size 8, width M. Please note that measurements may vary by size. Weight of footwear is based on a single item, not a pair.